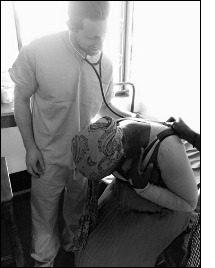 This February I went on a medical mission to Uganda. Our team consisted of 8 physicians; 4 residents and 4 attending physicians. It was a good mix, everyone was kind, receptive and easy-going. This fostered an atmosphere of friendship and mutual respect. We were stationed at a clinic in rural southwest Uganda called Engeye. It was founded approx 12 years ago by a medical student with the coordination of a local Ugandan. Everyday our team would see approx 100 patients with illnesses ranging from malaria and typhoid to mumps and intestinal worms. We each had our own interpreter which enabled us to get a focused physical but also to understand better the culture and expectations of local residents when it came to health care. We were immersed within the community, eating with the staff and playing with the local children in the afternoon. It was empowering to the see the impact that the clinic has on the community as it is a great sign of respect, pride and community cohesiveness. This was not my first trip to Uganda, I had been 4 years ago and worked at a hospital in the northwest. As I explained to my colleagues, with each experience in life one learns many essential life lessons. Whether it's something as simple as "always use a headlamp when walking around at night so you don't walk into an ant hill" or something more sincere as "a dream can become a reality when one understands their potential". With every trip I fall back in love with medicine and the art of basic clinical skills and history taking, which is the very core of medicine. I look at it as a symbiotic relationship, we help the patients while at the same time helping ourselves to become better physicians.